After publishing this post about five of my favorite pieces of Japanese GameBoy Advance box art, a commenter named Jin suggested I write a similar post about Super Famicom cover art. Well, here it is. Or maybe I should say "here's the first one," as a second is likely to follow tomorrow or the next day. 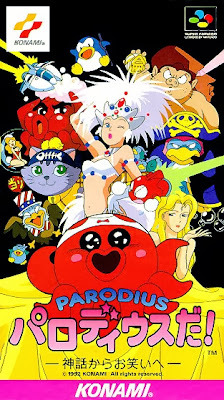 Parodius Da!--One of the best pieces of Parodius box art produced so far, if you ask me. 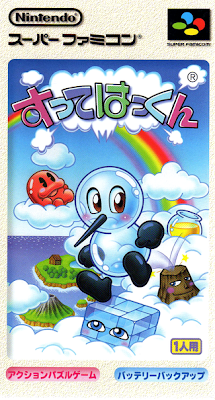 Also one of the most colorful illustrations to grace the cover of a Super Famicom game. As such, it clearly deserves a spot on this list--and in my games collection, at some future point in time. 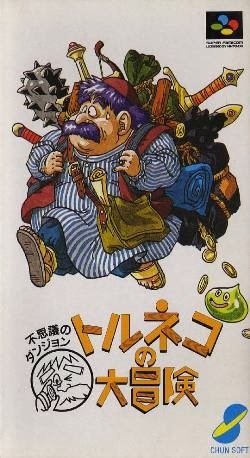 Torneko no Daibōken: Fushigi no Dungeon--More proof that sometimes simple cover art is the best. It helps, of course, that the centerpiece of this example is both humorous and appealing and that its logo has a bit more character than your average Super Famicom game. 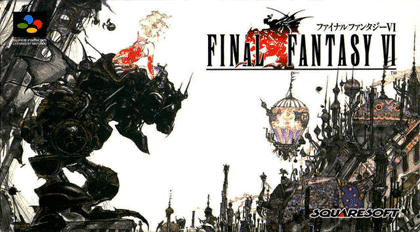 Final Fantasy VI--If I were to concoct a number of these posts, I'd include the box art created for Final Fantasy IV and V, too, but since I'm only publishing a pair of them, I'm limiting myself to just one piece of 16-bit Final Fantasy box art. In that case, I have to go with Final Fantasy VI's, which in my opinion is about the closest video game cover imagery has gotten to "fine art." Sutte Hakkun--Not as fabulous or as intricately designed as the cover art above and below, but this one brings a bit of old-school whimsy to the proceedings, don't you think? Plus, it features a rainbow, which always earns a positive nod from yours truly. 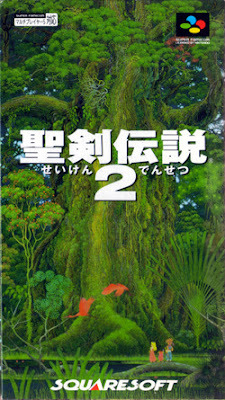 Seiken Densetsu 2--Easily one of my all-time favorite games, and also one of my all-time favorite game covers. Rarely has box art for any system--before the Super Famicom or after--ever looked so majestic, in my estimation. One of my favorite things about Super Famicom box art is a complete lack of any sort of style guidelines on Nintendo's part. Just stick a Super Fami logo in the corner and do whatever you like! Meanwhile in the US everything ended up in the same "frame," even 3rd party titles, which is the opposite of what it was like on the NES. I wonder what led to Japan's decision to go primarily vertical, and US's to go horizontal? Never heard of Sutte Hakkun before, but I really like the cover. Have you played it? It's at least somewhat obscure, Steve. It's really a series of games that started on the Super Famicom's Satellaview series and ended up on cart, too--near the end of the SF's life, as far as I'm aware. Anyway, the depressing thing about it is that even loose carts can go for quite a bit of money, and I'm sure CIB copies can go for more than $200. Ugh. Anyway, yes, I've played it--via emulation--and it's really nice. You should give it a go yourself! Oooh man.. Secret of Mana... such fond memories of playing through that one when it came out. Me and my then wife played all the way through it in co-op, start to finish. It was a great time. Oh, yeah, I have fond memories of this game, too. I pretty much played through it by myself, though. Still, an amazing game!